Two men from southeastern China got a surprise on their way to work last week when they discovered the nose cone of a lunar rocket peeking out from a clump of bushes. Huang Yijin and Zhang Hejin were walking through a forest near the village of Wuchang, Fujian province, about 5.30am when they stumbled on their unlikely find, Chinese news portal Dianwang Toutiao reported. The power plant workers’ first thought was that the large metal fairing was part of a crashed UFO, so they called the police. Authorities soon confirmed, however, that rather than coming from an alien spacecraft, the cone was in fact from the Long March 4C rocket used to launch China’s Queqiao relay satellite into orbit from the Xichang Satellite Launch Centre in southwestern China’s Sichuan province on May 20, about 2km west of where it was found the next day. The satellite launch was part of the broader Chang’e 4 mission – named after the lunar goddess in Chinese mythology – to send a probe to the dark side of the moon later this year. The China National Space Administration said earlier that Queqiao – or “Magpie Bridge” – would relay communications between controllers on Earth and the lander. 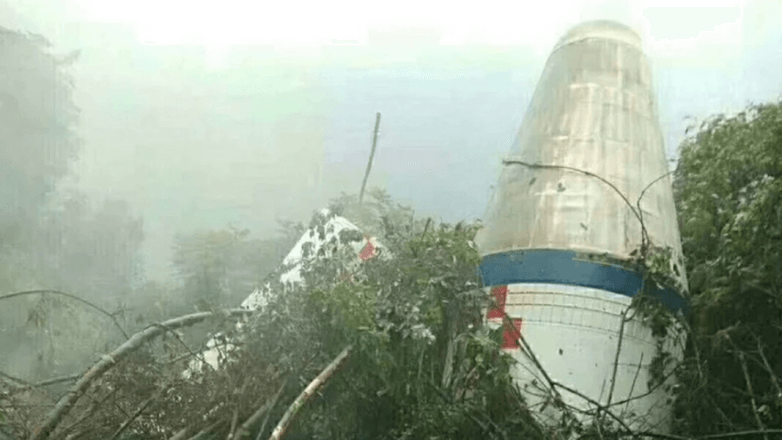 Once officials had determined the wreckage did not pose a threat to anyone – satellite fairings are designed to break away and fall back to Earth soon after take-off – they enlisted the help of some locals and carried it into Wuchang and put it in the village’s grain store for safekeeping, the report said. The website report said that while it was not uncommon for people to find debris from space rockets, the location of the Fujian find was unusual. After its short stay in the grain store, the nose cone was moved to a local museum before being reclaimed by workers from the launch centre on Wednesday, the report said.